What is a CSA? It stands for Community Supported Agriculture. You may have heard of farm sharing programs or Community Supported Agriculture programs (CSAs) before. They are gaining popularity and getting a lot of media exposure in recent years for their ability to help bring real and local food back to the table every night and support local economies. They are instrumental in helping people to eat their meals from farm to plate. All those small scale farmers in your area are at a serious disadvantage these days. They simply cannot compete with large agri farm operations that sell to major grocery markets. Small farmers usually have to sell to their neighbors, at roadside stands, and at farmer’s markets. They have had to work hard to find a loyal customer base and unlike large agribusiness operations, small farmers might find themselves out of business the very first time their crops are destroyed or fail to thrive. It is such a sad state of affairs. So….realizing that smaller farms serving the locals might soon be gone with the wind some of them have gotten creative and decided to extend an invitation to their local communities in the form of CSAs. I am happy to see that many have answered that call. So how does it work? CSAs work when the farmers sell a portion or a share of their harvest to their neighbors. For a seasonal fee they get a box of fresh farm fruits and veggies every week. I remember being giddy on delivery days each week…just waiting for my box of farm fresh goodies. The CSA that I belonged to in Arizona was run by a gal named Kelly and she included pertinent recipes every week so I was in culinary heaven each week. It was that first year that got me hooked on Kale…because I was swimming in it, LOL. Before that I had never even tried it so being a CSA member also exposes you to new and exciting foods. I did an interview with my local CSA farmer in Arizona at Desert Roots Farm if you want to read about it. Community Supported Agriculture is a partnership of mutual commitment between a farm and a community of supporters which provides a direct link between the production and consumption of food. Supporters cover a farm’s yearly operating budget by purchasing a share of the season’s harvest. CSA members make a commitment to support the farm throughout the season, and assume the costs, risks and bounty of growing food along with the farmer or grower. Members help pay for seeds, fertilizer, water, equipment maintenance, labor, etc. In return, the farm provides, to the best of its ability, a healthy supply of seasonal fresh produce throughout the growing season. Becoming a member creates a responsible relationship between people and the food they eat, the land on which it is grown and those who grow it. As Kelly touched on, the farmers have more freedom, security, and flexibility when their costs and products are paid for up front. The consumer benefits by having continuous access to local and healthy foods that don’t have to cause planetary destruction on their way to you. There is also a lot of risk for smaller farmers when surprises occur and they need to search used John Deere tractors in order to replace their equipment or when they fall ill and can’t work for some time, these are a few reasons why they are at a disadvantage when compared to bigger farms. The consumer absorbs some of the risk involved in farm management because if the crops fail for whatever reason the farmer has already been paid and he or she will not be forced out of business. The consumer, although unhappy to see no food that season, is satisfied in supporting his local community and protecting his or her local food sources. There are some CSAs that allow you to pay for your farm share or a portion of it in trade for labor. You might be put to work weeding, harvesting, packaging CSA boxes, or delivering the food. This arrangement keeps costs down for both the farmer and the consumer. In my area (Ohio) a whole share from May to October costs about $650 and that pays for a box of farm fresh goodies every week. You can also do a half share for a smaller family. In Arizona it was a bit more expensive. 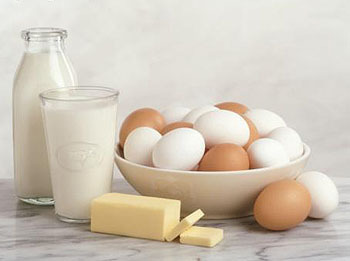 You may also be able to find CSAs that raise livestock and thus offer shares of beef, raw milk, chicken, eggs etc. There was nothing like that in my area but I get fresh eggs from the local Amish farms and hoorah….I found a herdshare program nearby that offers a share in a dairy cow and I will be getting 2 gallons of raw, organic milk every week. For the first year the price works out to be $3.65 a gallon and every year thereafter it is $2.65 a gallon. I have to pinch myself that is such a steal….I was paying $8.00 a gallon in Arizona. Other benefits of joining a CSA include the fact that the whole family starts eating healthy veggies and leafy greens more frequently. It also makes eating raw easier. Joining a CSA in your area might be one of the best things you can do to support your local economy and make a commitment to healthy eating. So where do you find one? Try Local Harvest for a listing in your area. And if there aren’t any don’t worry, you might be able to do what I am doing which is take a blended approach with a little grow-your-own, farmer’s marketing, shopping with the Amish, pick-your-own day trips, and herd sharing. You would still be eating healthier, eating local, and supporting your community by keeping your dollars local. Real Milk – To help you find raw milk, raw cheese, and herd share programs. Pick Your Own – A farm directory where you can visit local farms and pick your own food. Here is a video I did last summer of our berry picking adventure. Doesn’t it make you long for spring???? !